After about a week at home we headed back to the Oregon coast for my family reunion. Mom and Dad had rented a beautiful large house with an amazing view of Cannon Beach. This home was actually large enough for our entire family. We had a great time playing with all 18 of my nephews and nieces. Jared earned uncle of the year for spending 5 hours in the ice cold water jumping waves with the kids. All of the adults were amazed at his endurance in the cold water. The kids loved having an adult so that they could venture out much deeper than they would have been allowed on their own. 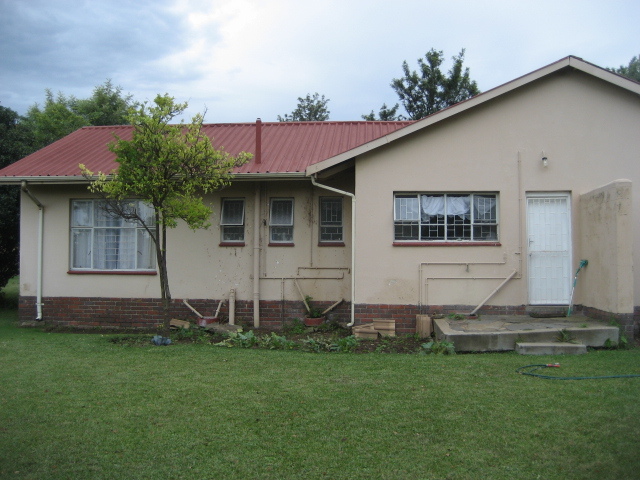 The house we rented had a huge yard and we played many games of red-rover, soccer, badmitten, tag and more with the kids. Uncle Corom brought his rocket and the first launch went perfectly (about 50 feet up) so he used a stronger “engine” and the rocket went about 200 feet up. Unfortunately on the way down it was blown into the top of one of the trees. We had a great laugh watching all the men try to get the rocket down. Jared videoed the whole thing. Here is the link if you wish to have a good laugh. (Link to be added in the near future). Wednesday we had a photographer come and take a large family photo. She also took some photos of Jared and I. We have not had professional photos of us taken since our wedding. 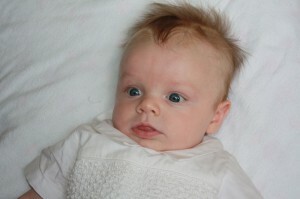 It will be nice to have a professional photo to post and for our adoption cards. On Friday we had a bonfire at the beach and roasted Starbursts and made S’mores. Most of us ended up with marshmallow and chocolate on our faces and had to wash off in the ocean water. My sister Lisa had driven from Texas with her five children and husband. 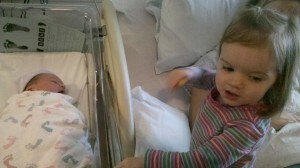 They are staying in Utah with Mom and Dad after the reunion. She was not looking forward to another 14 hours in the car with her 14 month old. Jared and I volunteered to take Lily (the 14 month old) on the plane with us. Mom thought we were crazy and Lisa loved the idea! We were a little unsure of how the trip back would go. Lily did very well. We made sure that she had time to stop and play at a park before we drove the 2 hours to the Portland airport. 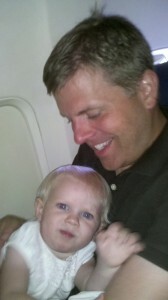 We made it through check in and security and then let her run and tire herself out before we boarded the plane. She did very well. 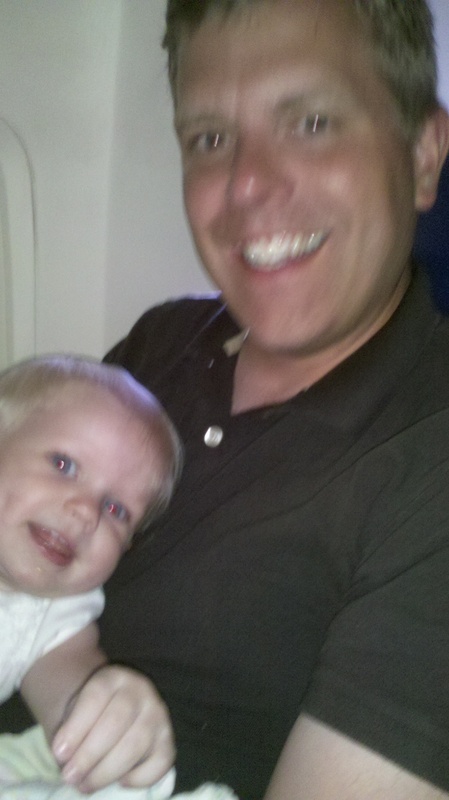 She only fussed for a few minutes towards the end of the flight. Jared was happy to hold her the entire flight and would not share with me. I was able to snap a picture of the two of them on the plane. It was taken with my phone and the lighting was not very good so it is a little blurry, but you can get the feel of it. We just enjoyed a wonderful reunion with Jared’s extended family. 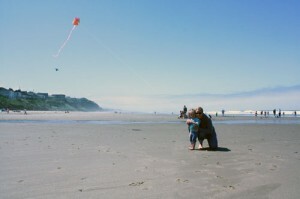 The Smith’s hold a reunion every other year and it is usually on the Oregon Coast at Lincoln City. This year Mom and Dad Martin were not able to join us as they still have a few more months left serving their mission in Florida. We missed them but still had a great time getting together with Jared’s siblings, Aunts, Uncles and cousins. We had beautiful sunny weather (although not always warm due to the wind on the beach). While Jared was playing in the water, I was playing with my 2 year old niece in the sand. We built sand castles and then Kendyl got to jump on them. We also went in the water and jumped the waves. She had so much fun. I love playing with her. I also got a number of photos of Kendyl flying a kite with her mother. We had a very low tide while we were there which made for great tide pools and access to caves that the waves have cut out of the rocks. The kids (and the adults) were amazed by the amount of sea life that was on display at in the tide pools. The caves were interesting and some had drift wood that had been wedged up in the ceiling by the powerful waves. We live in an amazing world! We also enjoyed the Forth of July Fireworks. We had a great view from the house that looked down the beach and we saw a number of private shows as well as the big Lincoln City show. It was wonderful! I love watching fireworks especially with friends and family. What a great reunion!!! We were sad to leave everyone and look forward to the next one. My sister’s family is taking a very long road trip and is not looking forward to the long hours in the car with 5 kids. I decided to help make the trip a little less stressful. 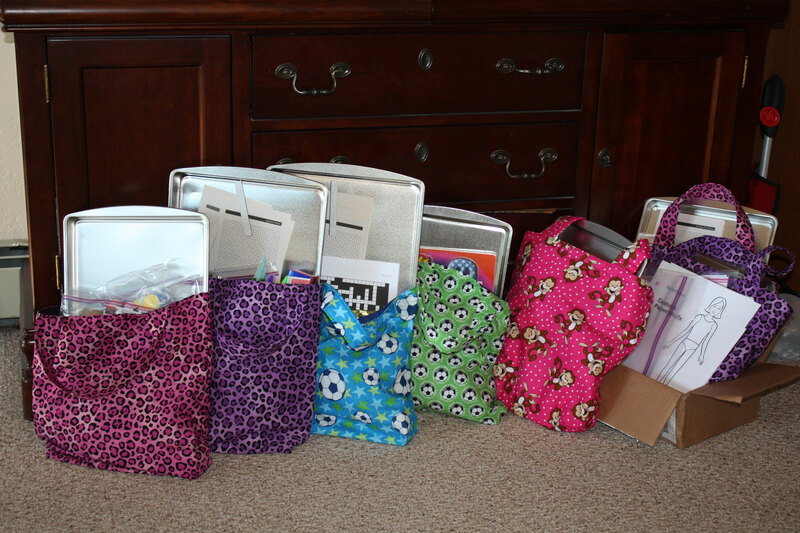 I was able to find a number of great ideas on the web and then made a bag for each child and have filled them with car appropriate crafts and activities. It was fun choosing fabric for each child and then creating a pattern for the bags. Give each child a cookie sheet. It works as a lap board and can hold small pieces. You can add magnets to game pieces and draw checker boards or other games on it. Car bingo and gummy bears. Check out these bingo cards. Pipe cleaners to make animals and other items. Aluminum Foil. Kids can create jewelry, hats, animals, allow the kids to express their creativity. Origami. Fish, Frog, Turtles, Boats, Stars, Flowers. Hours of fun. Items from the dollar store. Coloring books, and a bag of balls. Paper dolls and clothing to color. Familyfun.com has great papercraft ideas. Just cut the needed paper before you leave. We had the opportunity to have some old friends (Joy and Peter Rassmussen) over for dinner. They are in town on vacation this week and it was fun catching up with them and their children. It’s quite a coincidence since I was roommates with Joy for a few months in Portland and Jared was roommates with Peter when they lived in Connecticut both about 13 years ago. (We wish that they would have introduced us to each other… maybe we could have met much earlier). It was great catching up and reminiscing about old times. We also enjoyed a spontaneous game of dodge ball with the kids. Although the kids had the advantage being at the top of the stairs with the parents sitting in the living room. I should have taken a picture. We were honored to participate in the blessing of our nephew this weekend. It is wonderful to see the priesthood in action and to feel of the love Heavenly Father has for his little ones. We were also able to get some pictures of Jared and I. I love the ones where we are having fun. I especially love the lilacs (one of my favorite flowers). We were able to watch our 2 year old niece, Kendyl, for the weekend while Jared’s sister had her second child. We spent the day playing with Kendyl and making trips back and forth to the hospital to see the new baby. We had a great time! We love spending time with our nieces and nephews! 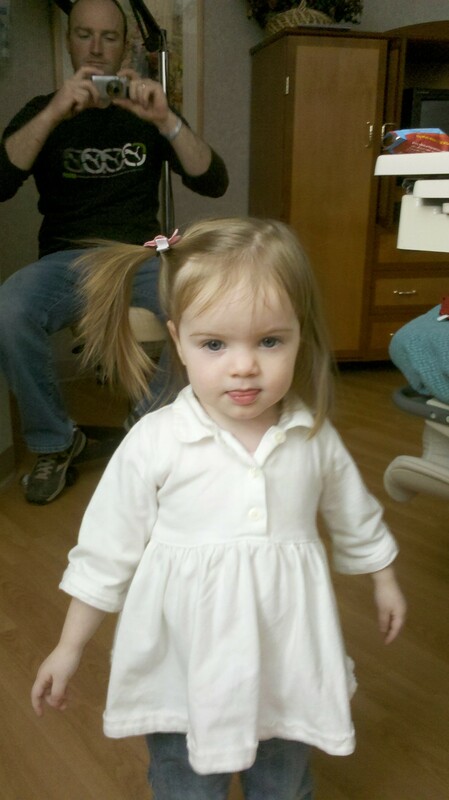 Also, we spoke with the Labor Nurses about wanting to adopt. We are starting the advertising process to find a baby to adopt. After having friends and family as guests for the last 3 weeks, we finally had a Saturday to ourselves. So we started conquering our project list. After spending a couple of hours installing a ceiling fan for our tenant, Jared helped me come to the realization that it would be more cost effective if I let him work on his computer projects and we pay someone to come in and do our projects for us. So I will be calling a handyman tomorrow to see when we can get the work on our master bedroom/bathroom going. I can help when I have the time and we should hopefully move the project along much faster than it has been going. YEAH!!! Kudos to Jared, the ceiling fan looks and works great! 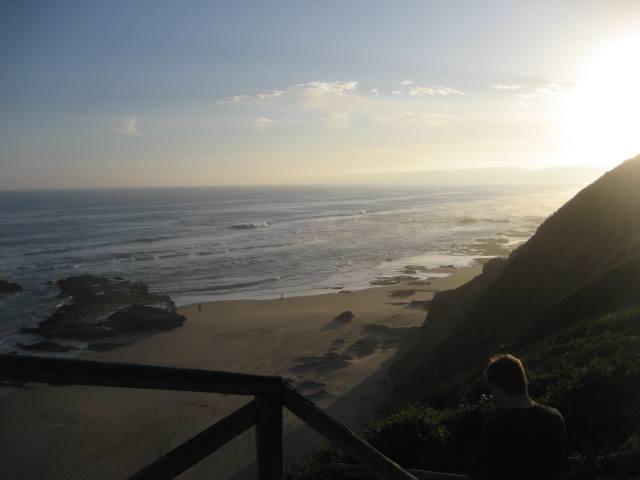 I have finally finished posting a very brief outline of our trip to South Africa. I can’t believe it has taken me so long. We departed Port Elizabeth, South Africa around noon on the 29th of March and arrived home around noon April 1st. When you add the time difference, we figured that we spent about 32 hours getting home. It was worth it. We had a great time and an amazing experience. Just before midnight on the 29th, Erika wakes me up to say happy birthday! She just realized that it was still my birthday while filling out the custom’s forms and realized she had forgot to mention it earlier. It was funny. Random thoughts and photos from our trip…. Most of the pluming is on the outside of the house. Water coming in and water going out. 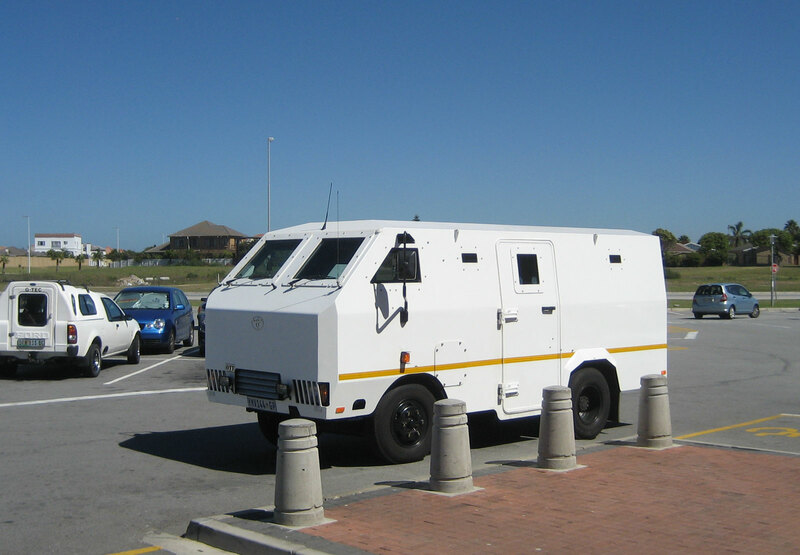 Take a look at this armored truck and the commando guard that was patrolling the parking lot. One of the best food stores in South Africa is Woolworth’s. This was hard to get used to and didn’t match my memories of the Woolworth’s I remember. We would compare it to Trader Joe’s. We attended church today in Knysna (pronounced Nizna). 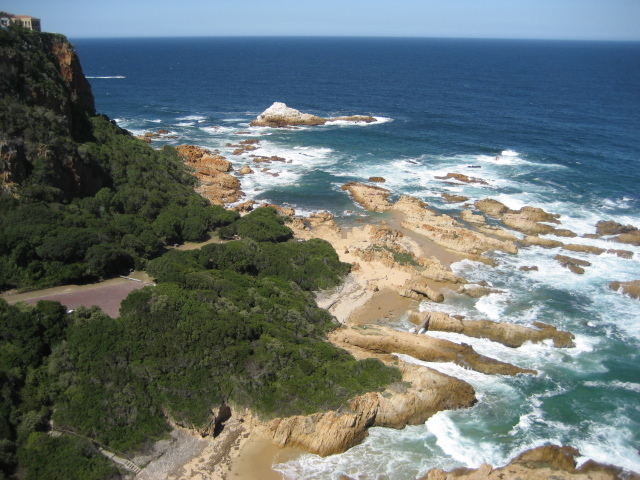 It is a small tourist town on the garden route in the West Cape. The branch had about 36 people and they were all glad to see us. About half were English transplants / retirees. The rest were local from a nearby township. This combination made for very interesting dynamics. It was interesting to go to church that was controlled completely by the English. We had to include the photo on the right. 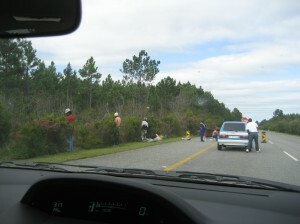 This is a typical South African rest stop. We stayed the night in Jeffery Bay. We found a great place on the beach. It was one of our less expensive and nicest places. Two sliding glass doors with an all-beach view. 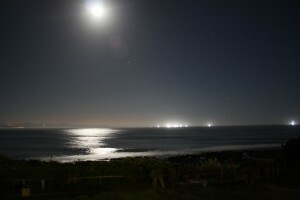 The moon was almost full and the light was reflecting off the Indian Ocean. You could see the a row of cargo ships on the horizon. I counted at least 12 at one point. I had fun playing with Erika’s camera — taking night shots. Wildernes is a nice small town along the garden route. We stayed at a small B&B that was owned by a retired Swiss couple. They were very friendly and we decided to stay another night. 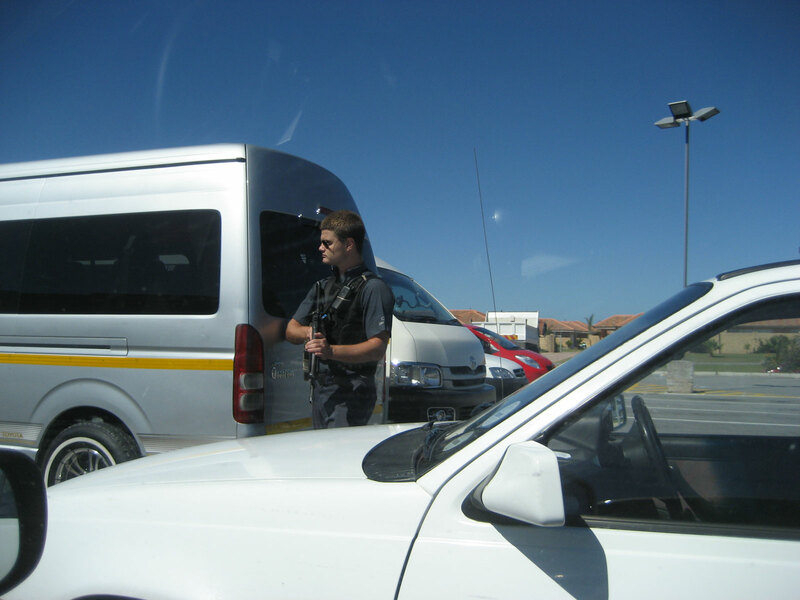 We were warned about how long it takes to be fed at restaurants in South Africa. Our longest was in Wildernes at just over two hours from the time of arrival until we finally received the bill. To make things worse, the food wasn’t good either. We went were all the locals were going. Guess I ordered the wrong thing. I have noticed the local food is pretty bland and has a lot of English and Dutch influence (I know, that is were the people came from). The next day we decided to go see ‘The Heads’. It is a small canal of the ocean that feeds a large bay. It was picturesque with waves crashing at the base of the cliffs. We then went to town for more bottled water. We found a Shop Right grocery store. It was packed with people from the local township. We waited in line to pay for at least a 1/2 hour. We got back to the car and was reminded of a warning Erika’s parents gave us. Don’t leave anything visible in the car. We kept all the valuables in the trunk (or boot) and in the glove box. 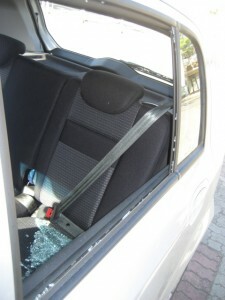 Someone broke the side passenger window and took our jackets. I am sure they are not worth the window they broke. We spent the next few hours finding the local Avis and swapping out our car. We heard stories, but didn’t think to hide our jackets.